My wife had been driving more than usual, because I’ve been typing. And typing. And typing. Because she’s been driving a lot, I’ve become aware of two things. First, she swerves to the side of the freeway it she sees a large spider scamper above her head and race towards the windshield. We never found the spider, but I’m pretty sure her nerves were several hundred yards behind us. So was my heart. Second, she stops for jeeps using a technique strikingly similar to her spider-veering-off-the-freeway maneuver. I witnessed her using this technique today after she spotted a flattie just south of Albany, MN, next to a fence along Interstate 94. Now, I don’t remember how fast our jeep goes from zero to 75, but I can say it can brake pretty quickly from 75 to 0. And, I’m not saying she backed up along the shoulder of I-94 to get this shot, but I am saying she’s the kind of wife who’d do that for me so I could share a pic like this with you all (funny story, this was shot with my iPhone, which I’d done as a backup shot . . the real camera with the zoom lens apparently didn’t have the disc inside it . . . sigh). Through the zoom lens I could easily see the CJ-2A bow holders on the driver’s side. It actually looked in decent condition. There was no evidence of a for sale sign. Maybe google maps show it? I don’t have the time to look tonight. I think I spotted it. Looks like its on the edge of that property but what an odd place to park it and leave it. We checked on this a few years ago and at the time this jeep was owned by the same people who own the Chrysler/Jeep dealership in Albany MN that you guys passed through. They own this property where the jeep sits on and use it for groups to drive around with jeeps and 4 wheelers. 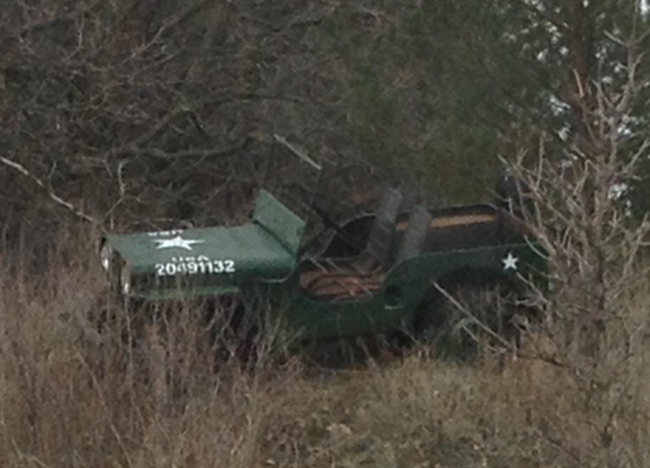 They also owned a 3B jeep painted like a military jeep that they would take to car shows and parades in the area.